GTD, or Getting Things Done, is a system by David Allen. 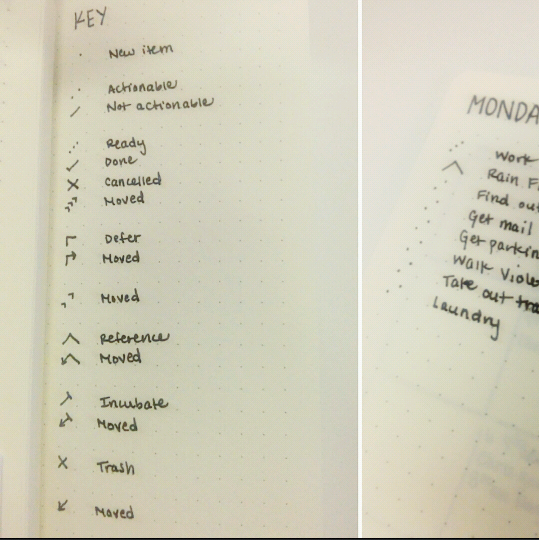 This post will cover how I’ve adapted GTD to my Bullet Journal Key. You can read the book for more information on this workflow. There is also material online. All incoming “stuff” captured in my bullet journal starts out with a dot. When I get a chance to process, I look for all single dots and either mark them as actionable or not actionable (see picture). Then I process further according to the workflow. When I’m done processing, I move everything deferred and incubated to the calendar. I move delegated items to a Waiting For list, and Reference items to specific collections or the calendar. Note: I only used this Key for one day. It got too complex for my liking. I posted this for reference, in case anyone else can use it.